Robin Guthrie is one of my favorite musicians of all time, and 2009 is a big year for him. He has four releases planned for this year, and Mirrorball is the first of them. This record features Mr. Guthrie collaborating with John Foxx. Mr. Foxx got his start in music way back in the '70s as the lead vocalist in Ultravox. He left after their third record to pursue a solo career, and since then has, apparently, been releasing records of voice and synthesizer. To be honest, i have a few Ultravox records, and was aware that they had changed vocalists at one point, but i am far more familiar with their Midge Ure-era. Mr. Foxx was, essentially, an unknown to me going into this record. He is an interesting vocalist. 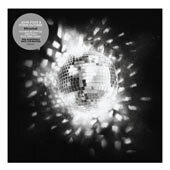 On Mirrorball, his singing is abstract. There are no real lyrics, except for at the very end of Estrellita where he sings a few lines in English. Well, actually, his style is that he drags the individual notes out, so perhaps he is singing in English throughout, and it is just such an exaggerated style that it doesn't usually sound like it. In many respects, Mr. Foxx's style reminds me of Nusrat Feteh Ali Khan. He has a similar rich voice, and he has remarkable control. The tones that Mr. Foxx sings sound similar as well. That is to say, phonetically i can hear a similarity. Hmmm… maybe Foxx is singing in Urdu here. I kinda doubt it, but i guess that is possible. However, whatever he is singing in, i like it. I will have to investigate more of his work. Mirrorball is nine tracks in a little under 40 minutes, so let me go over each track. The title track kicks things off. Here, Foxx sings expansively, his rich voice echoed and expanding to fill all available space, while Guthrie calmly backs him up with chiming guitar and some synth washes. This is ambient and lovely. The next tune, My Life As an Echo, is a typical Guthrie song. This is instrumental, with a nice strummed guitar, a simple drum bit, and Foxx playing piano. The voice is back for The Perfect Line, where Guthrie's guitar playing builds and builds, until it almost overpowers the voice. Foxx's vocals sound different on Spectroscope, almost like he is singing a Gregorian chant. I suppose it is the scratchy vocal loop that makes it seem like this, but it is a nice effect. This is a mostly Foxx tune, with Guthrie just providing backing as Foxx does his vocal thing. It is very nicely done at that. On Estrellita, it is Guthrie who is looped in multiple layers. One layer sounds acoustic, while occasionally there is a nice chiming electric hit, but never too powerful, just a faint tinkling behind the voice. Here, Guthrie is playing with that vaguely Western guitar sound he used a lot on the last few Violet Indiana releases. This is a fun tune. Luminous is a really lovely ambient tune of shimmering guitar with amorphous vocals. This followed by Sunshower, which could have come off of Guthrie's soundtrack to 3:19. Foxx's voice adds a nice layer. This really works – it is this song, in particular, that makes me wish that Mr. Guthrie worked with a vocalist more often. At the end of the song, Guthrie is playing some high-pitched notes while keyboards tinkle and Foxx sings lightly. This is an utterly beautiful end to the song. That moment of sheer beauty fades into Ultramarine, which is my favorite on this record. This song moves at a laconic pace, with many layers of guitar. Foxx's vocals are light and delicate, and Guthrie's many guitar lines dance around the voice, all backed up by a faint synth wash. No real beat here, but one of the guitar lines is a repeated rhythmic chiming. This reminds me a lot of something off of Four Calendar Café. This song is pretty much exactly what i hoped this record would sound like. It lives up to my expectations. Finally, we end with Empire Skyline. Here Foxx's voice is in layers, one a nice chant, one a dramatic lead bit. It keeps building and building while Guthrie's guitar whines away in the background. And that's it. In and out in 40 minutes, but oh what 40 minutes they are! This is a lovely ambient record, and i highly recommend it.